Established in 1994, by Cindy Norcott, Pro Appointments is a multi-award winning recruitment agency, focusing on supplying temporary and contract staff, as well as offering a labour brokerage and payroll administration service to many of Durban's finest companies. Norcott says, "I started my company, Pro Appointments, 24 years ago from a spare bedroom with no start-up capital. Over these past 24 years, it has been a story of rags to riches in that we have grown from strength to strength." 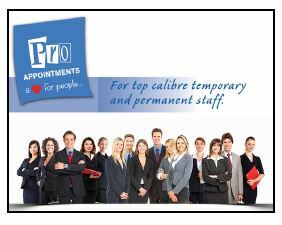 of candidates who are available at short notice to work in a variety of temporary and contract positions, including reception, switchboard, administration, data capture, call centre, retail, production and stores. "We have long standing relationships with our clients. Most importantly, we have been able to change thousands of lives for the better by placing people in temporary, contract and permanent jobs. We have also been able to help our clients grow their companies by providing them the best possible staff we can find." Cape Town. The company is pleased with the difference that it makes to the lives of the people that are encountered. "By putting our motto of "having a heart for people" into practice and on a daily basis, we offer advice, support, information and material for job seekers at no extra cost." Norcott is also proud of her wonderful team of staff and a large part of the focus in the business is staff development. "I am proud of the way in which we have developed our staff over the years through training, mentoring and coaching." Pro Appointments hosts a free training course several times a year for unemployed job seekers, called Career Kickstart. The company also hosts several business seminars per year, which are very affordable, to upskill its clients. The company's plans going forward are to continue growing its reach and to continue building relationships with its clients. In order to achieve growth, Pro Appointments will focus on delivering the right staff to its clients at a cost-effective service. Norcott is also the chairperson and founder of the Robin Hood Foundation, a non-profit organisation that helps the poorest members of society through a variety of community projects. resources directly into the hands of the poor." The Robin Hood Foundation runs a wide variety of projects, including Bless a Granny, Love the babies, Gogo bags, Hope Breakfasts and fun days at schools for disabled children as well as hosting free entrepreneurial conferences. The Robin Hood Foundation has become well known for the difference it is making. Pro Appointments is the head office for the Robin Hood Foundation. The company acts as the administration centre, runs the accounts and is a drop off point. Every year, the Pro Appointments staff attend various community projects for the Robin Hood Foundation during work time. "I am proud of the difference we make every single week," says Norcott. Norcott has won many awards for business excellence as well as her contribution to the community. She was awarded the Small Business Marketer of the Year award by The Marketing Federation of South Africa in 2003 and in the same year, she was nominated as one of the 29 Awesome Women of the Year by Cosmopolitan magazines. Norcott was also named the Regional Winner of the BWA Entrepreneur of the Year competition in 2003. In 2004, she was awarded the title of Sanlam's Business Owner of the Year for May, in conjunction with SABC's 3 Talk. In 2008, Norcott was given a Paul Harris award by Westville Rotary for her work in helping the poor. In 2013, she was awarded the CEO Communications Most Influential Women in Business and Government award for the services category. 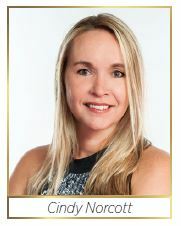 In July 2015, she was voted as the Lead SA Sunday Tribune Local Hero for KZN", and also in 2015 was the recipient of the Remax Community Service award from Remax Panache. In 2016, she received the Business woman achiever of the year award from Margaret Hirsch. 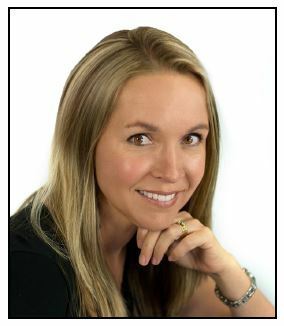 Norcott is an accomplished motivational speaker and she has a selection of 20 motivational and inspiring talks that she does for conferences, business meetings and women's groups. Customer Base: >400 medium to large companies in the greater Durban area.